Northern Expressions Needlework: The start of something.... sparkly! The start of something.... sparkly! Like bling? I wish I could capture how sparkly this is. Introducing Garnet, the first in a series of mini Birthstone Samplers. Stitch them individually, stitch them in groups or stitch them all together if you're brave! Each monchrome design is 100x100, stitched in Soie D'Alger (or you favourite thread, I'm always happy to do conversions when I can) with Swarovski crystals to match that month's birthstone and a coordinating Delica bead. Each chart also includes instructions and mock ups for stitching multiple charts together. 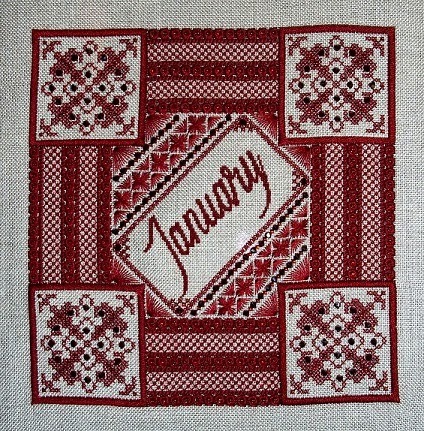 Stitch them as a family sampler showing the months for all family members. Stitch them as a wedding or anniversary sampler by including the birth month for the bride, the groom and the month they were married. Stitch them individually as birth samplers by adding the name and date below. Or stitch them all together as one big sampler! Oooh, looking forward to these!! Beautiful! !